One of my very favorite foods is coconut. Sweet, savory, beverage, breakfast, entre, dessert, sign me up. Another favorite is seafood, so in a Gilligan’s Island scenario I’m all set…as soon as I figure out how MaryAnn made all of those pie crusts. Did you know you could make a Mounds-like bar with only three ingredients? I didn’t until just now, and the world will never be the same. Thanks to Not Enough Cinnamon for the recipe. I’m all for starting the day with coconut, so these Coconut Buttermilk Pancakes from The Taylor House sound perfect. 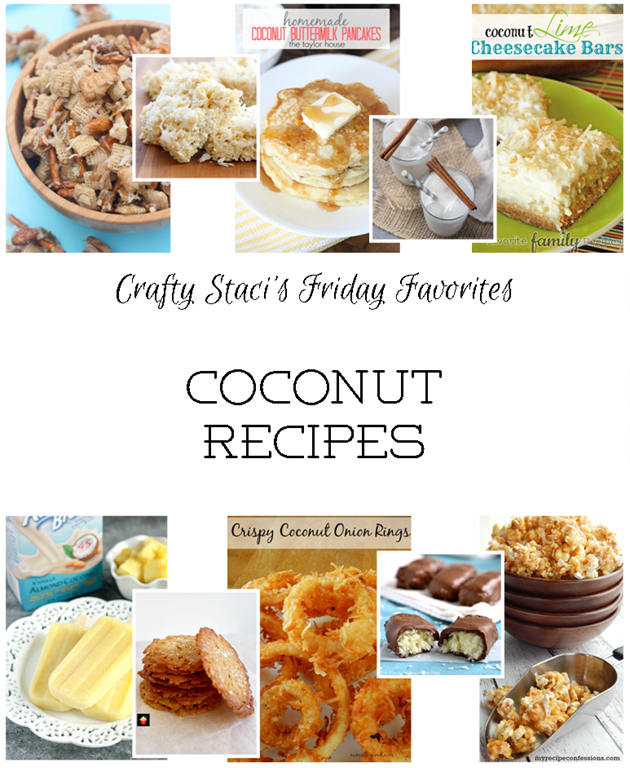 I’m pretty sure I saw a recipe out there somewhere for coconut syrup – too much? Toasted Coconut Caramel Corn from Cookie with Ruthie – yes please! These delicate Coconut Thins from Love Foodies look like a great way to satisfy a coconut craving without going overboard. Providing I can leave some on the plate. You can’t go wrong with almonds and coconut. Next on my must-try list is this Almond Coconut Chex Mix from Tastes Better from Scratch. We are a house divided when it comes to coconut, but I think in spite of that my husband would give these Crispy Coconut Onion Rings from Num’s the Word a try. Coconut Lime Cheesecake Bars from Favorite Family Recipes. Need I say more? I love good horchata, I can only imagine that this Coconut Horchata from Baking a Moment is amazing. I couldn’t wrap this up without including the classic combo of coconut and pineapple. There’s just enough summer left to enjoy these Coconut Pineapple Ice Pops from Live Well Bake Often.